Avatars for you to use at your Live Journal, Forums or at MSN Messenger. Pick an icon for your AIM Messenger. Make your desktop beautiful with a Hilary-wallpaper. Beautiful art which fans has contributed with. 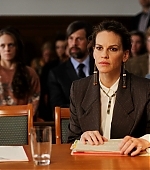 55 Steps is based a the inspiring true story of Eleanor Riese, a mental illness patient herself, who brings a class action suit to give competent mental patients the right to have a say in their medication while they're in a hospital, and Colette Hughes, the lawyer appointed to her case. The story follows Swank’s character, who has to travel back home to help take care of her mother, whose Alzheimer’s takes a turn for the worse after an incident on Christmas Eve. A teenage girl is raised underground by a robot "Mother" -- designed to repopulate the earth following an extinction event. But their unique bond is threatened when an inexplicable stranger arrives with alarming news. Trust tells the story of Getty’s grandson, John Paul Getty III, heir to the family’s oil fortune. It is set in 1973, when the young Getty is kidnapped in Rome and his mafia captors are banking on a multi-million dollar ransom. Read more about the causes that Hilary is involved in here. Hilary Swank Fan is an online source dedicated to Hilary Swank run by a fan. The site was in established back in 2004 and it has the latest news on Hilary and her career, information, photos and media. We hope you'll enjoy the stay and feel free to bookmark the site! We are not claiming copyright for the content or images on the site, all pictures copyrighted to their respective owners.